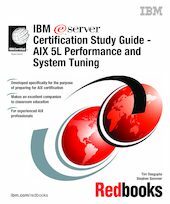 This IBM Redbooks publication is designed as a study guide for professionals wishing to prepare for the AIX 5L Performance and System Tuning certification exam as a selected course of study in order to achieve the IBM eServer Certified Advanced Technical Expert - pSeries and AIX 5L certification. This book is designed to provide a combination of theory and practical experience needed for a general understanding of the subject matter. It also provides sample questions that will help with the evaluation of personal progress and provide familiarity with the types of questions that will be encountered on the exam. This publication does not replace practical experience, nor is it designed to be a stand-alone guide for any subject. Instead, it is an effective tool that, when combined with education activities and experience, can be a very useful preparation guide for the exam. Whether you are planning to take the AIX 5L Performance and System Tuning certification exam, or if you just want to validate your AIX skills, this book is for you. This publication was updated to include the new content included in Test 234, which is based on AIX 5L Version 5.1.